The beautifully detailed bust of a magnificent warmblood horse bust will be created using your own horse's hair. This special way to remember a current horse friend, or a past favorite will grace your desk, table or mantle for years to come and remind you of that special equine. Also beautiful gifts or awards for any horse person or group involved with warmbloods. This piece is 9" tall x 8" wide x 5.5" deep. It includes the square, multi-level base as shown. 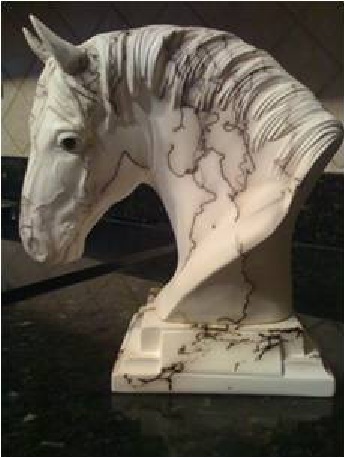 ~You may have this piece done in the natural creamy white & black finish of horsehair pottery, or make it even more personal by adding having us add your horse's markings and color for slightly more. After placing your order, you will receive an email with instructions on how and where to send your horse's hair and possibly photos if you'd like the colorized piece. For this piece, we'll need a minimum of 30 hairs.